I’ve been hearing quite a bit of good reviews lately on the products by Sunday Riley. I was prompted to look further into the product line after reading a review by my favorite Makeup Artist, Lisa Eldridge, who boasted about the amazing benefits her skin received while detoxing at a (I’m sure super lux ) spa. I decided it was time to dip my toes in and give Sunday Riley a try. I opted for the Disrobe Body Lotion, since it was given such rave reviews by Lisa. At $65 a bottle, I prayed my first impressions of this bottle would not be dismal. My prayers were heared. Not only is the smell amazing (I mean 2 hours later I am still catching whiffs of it and dying a little inside at how good I smell! ), but after applying it all over my body, my skin looks much more even and has a silky texture such that I have never gotten from a body lotion before. I realized after the first application that it would probably not take me long to run through this initial bottle, so with future applications Im going to have to be little more conservative with how many pumps I use. 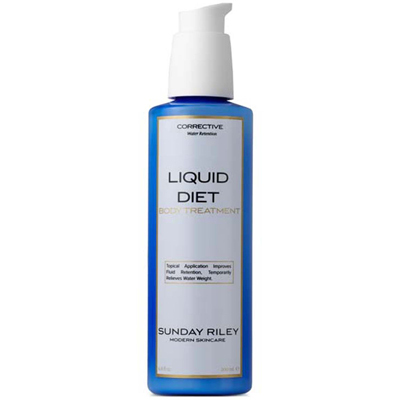 I’m also looking forward to trying a few other products, specifically the Liquid Diet (which if the other reviews I have read are anything to go by this little baby might be a miracle worker). Liquid Diet is promoted a temporary reliever of water weight wherever you carry it on your body. I aim to use this on my hips, thighs, tummy and upper arms. Can this slim me down a bit? Dare to dream… but any help is appreciated when on the mission to a leaner body. As Sunday Riley products are 99% pure, ( with a blend of 5 Native American botanicals) I don’t plan on stopping at body care. The Ceramic Slip cleanser, a foaming cleanser is next on my list. 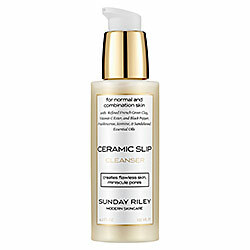 If all of the Sunday Riley products smell and work anything close to Disrobe I may have found my holy grail skincare.